Poor eyesight is limited to about 10’—Because of their extreme-nearsightedness, they are prone to falling into uncovered window-wells and other similar pit-like perils, and limited agility makes them unable to escape without assistance. But, they have excellent senses of smell and hearing. 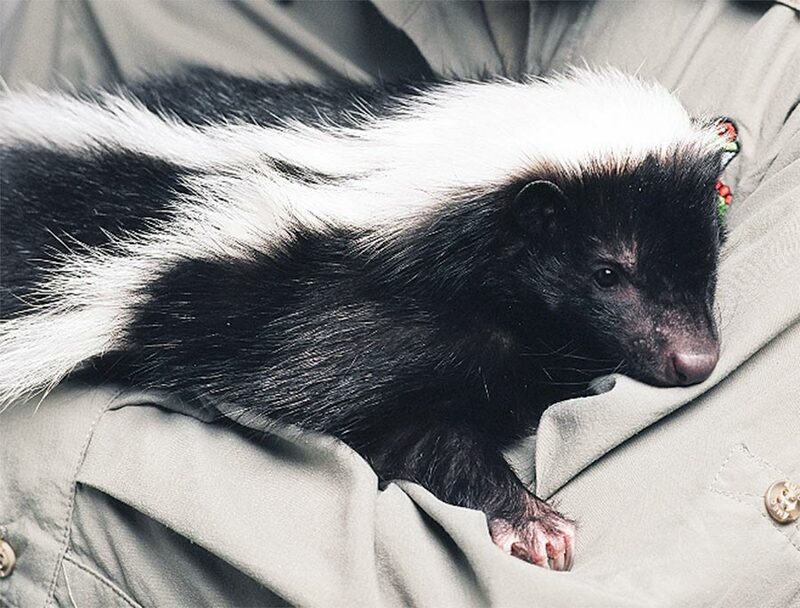 Skunks are gentle animals who tend to be nocturnal, but are sometimes out during the day. 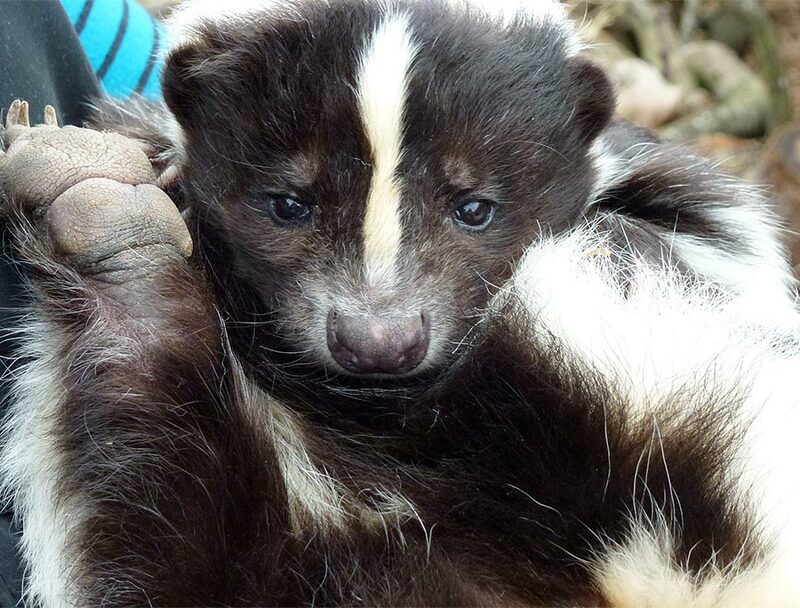 Skunks are extremely adaptable and thrive in many different habitats. Dens can be made in tree hollows, hollowed out logs, brush piles, abandoned animal burrows, and underneath porches, sheds and other structures. As long as food, shelter and a water supply are available, because they rarely travel more than 2 miles from their established dens, a skunk will typically settle down. Skunks will occasionally dig their own burrows underground if no other shelter options are available. Activity: Skunks are nocturnal, so they are most active at night. They do not hibernate, but they tend to be inactive during the coldest months in winter, when many gather in communal dens for warmth. 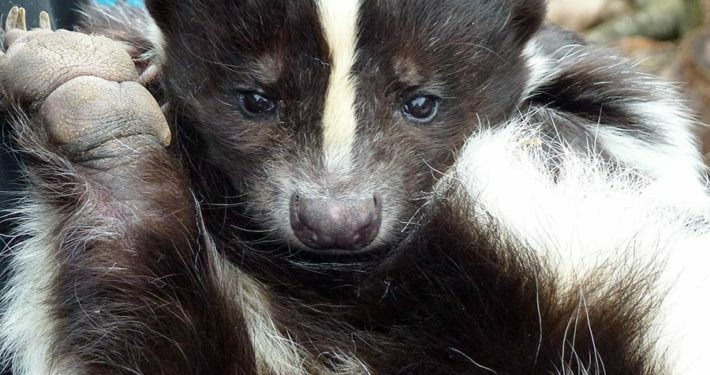 For the remainder of the year, skunks are generally solitary, living and foraging alone. Reproduction: Mating season is one of the only other times when skunks tend to socialize. 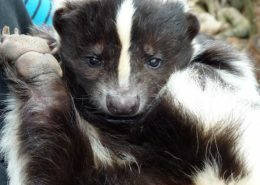 Skunks have litters of 1-7 young in late April through early June. Digging: Skunks have strong forefeet and long nails, which make them excellent diggers.When no other form of shelter is available, they may even burrow underneath buildings by entering foundation openings. They dig holes in lawns, gardens and golf courses in search of food like grubs and earthworms. Skunks are omnivores and opportunistic eaters. Their diets are flexible, often shifting with the seasons. They will eat insects, bird eggs, small rodents, frogs, fruits & berries, mushrooms and and items in your garbage pail or compost pile. Spraying: Spraying is a skunks last line of defense and generally use it only when cornered or defending their young. 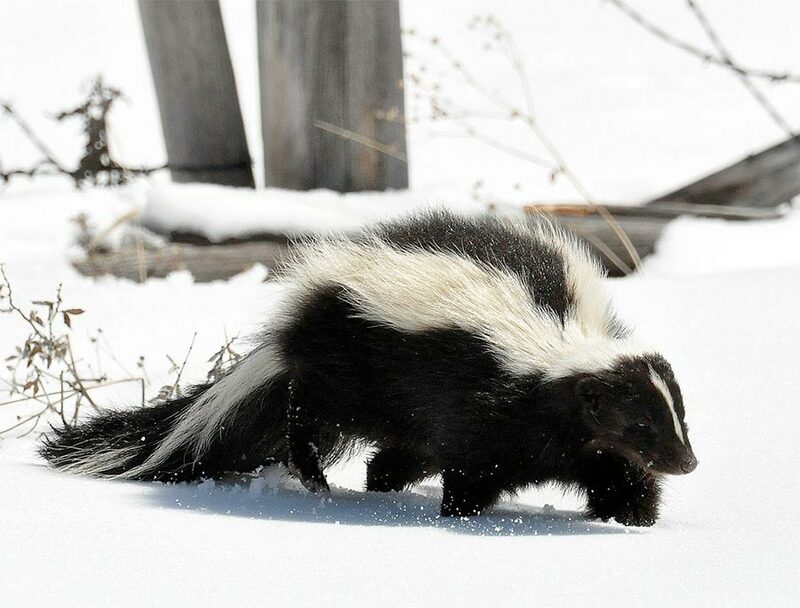 Before spraying, a skunk will generally growl, spit, fluff its fur, shake its tail, and stamp the ground. If the intruder does not leave the skunk will then lift its tail and spray. 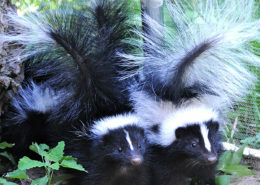 Skunks spray because of movement, so if in their vicinity move slowly and speak softly. 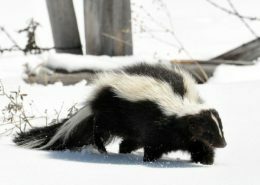 rabies - There are two forms of rabies in skunks: the "furious" form, where skunks become aggressive, and the "dumb" form where they become unphased by human presence. 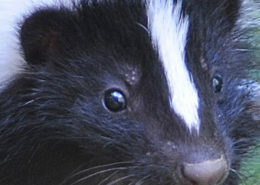 Skunks and Rabies: Skunks are the primary carriers of rabies in the Midwest. Rabies is usually fatal to humans and pets unless treated immediately. 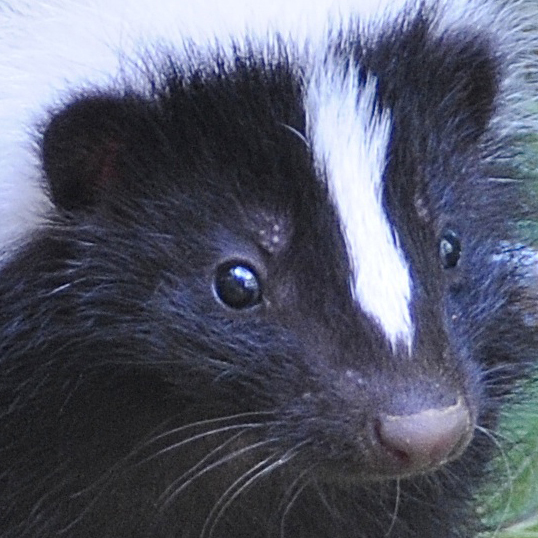 If you suspect that a skunk may have rabies, do not approach it - call animal control immediately for assistance. Some other signs of rabies in skunks to look out for include: activity during the daytime, an unsteady or disoriented gait, drooling, and/or foaming at the mouth. This by itself is not cause for alarm. 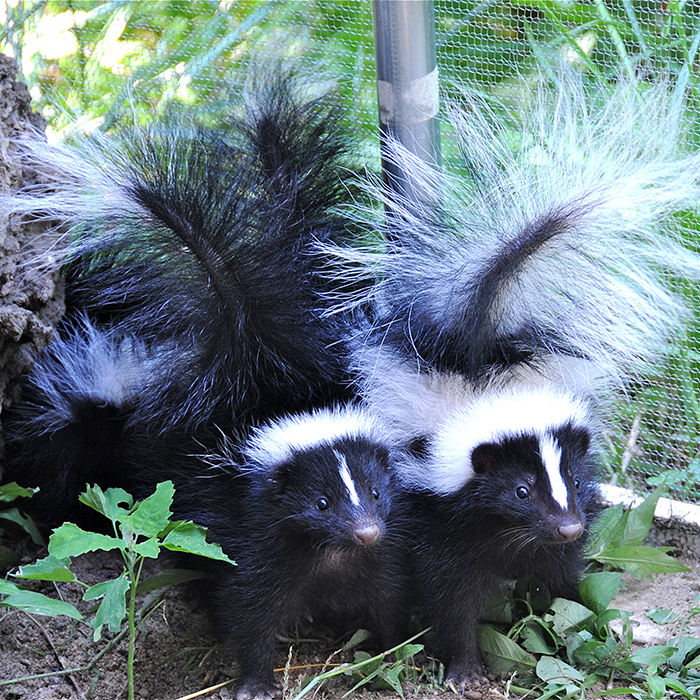 Skunks are sometimes active by day when people leave out pet food or when the skunks have hungry young to feed. Mix together and massage into area. Leave for two (2) minutes, rinse thoroughly with water. Repeat if necessary. If skunk is acting strangely—if it circling, dragging itself, acting injured or unusually aggressive? Call an ACO to assess and handle the situation.